Do we need to replace missing teeth ? Yes, there are many important reasons why we need to replace missing teeth. Although appearance is what usually comes to mind, the most important reason is that missing teeth adversely influences oral health, as well as overall health and general well-being. Tooth loss affects thousands of people in the UK every year and it can happen to anyone at any time. Trauma, accidents, tooth decay and aging all contribute to tooth loss; even things like medication, eating disorders and pregnancy affect oral health. However, the most common cause of tooth loss today is gum disease. Gum disease affects three out of four adults in the UK over the age of 35 and often goes undetected. Recent studies strongly suggest gum disease may increase the risk of heart disease and stroke due to the high levels of bacteria found in the infected areas of the mouth. In addition, inflammation caused by gum disease can trigger a chronic inflammation response in other parts of the body, which studies have shown also raises the chance of heart disease and stroke. The gap left by missing teeth causes stress on the remaining adjacent teeth, so they will eventually lean into the empty gap and alter the way your upper and lower teeth bite together. 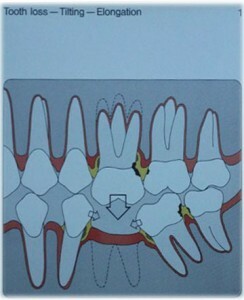 The diagram on the right shows the lower teeth tipping towards the space. This causes food to be stuck in between the spaces, contributing to both tooth decay and gum disease. Missing teeth also causes bone loss in the jaw, which can adversely affect your gums and other teeth. In the diagram on the right side, you can see the effects of missing teeth on the adjacent healthy teeth. Natural teeth migrate towards one another. In other words, there is tendency for upper teeth to grow downwards and lower teeth to grow upwards. This process is our body’s way of constantly keeping our teeth in contact with one another to facilitate normal function. As the upper and lower teeth undergo tooth wear, the teeth migrate towards one another in order to maintain contact. If a tooth is missing, a problem will arise as the opposing teeth over-erupt. This over-eruption causes other problems, like food trapping, gum disease and ultimately, more tooth loss. In addition, tooth loss can significantly affect one’s confidence. People with missing teeth often avoid laughing and smiling in the company of others. It can be embarrassing to the extent that some people will avoid socializing altogether and end up living a secluded, lonely life. Improving your teeth can improve your entire appearance, making you look younger, healthier, happier and above all, giving you more self-confidence. Although dentures can solve cosmetic issues caused by missing teeth, they often affect ones self-esteem due to their mobility. With time and bone loss, dentures become loose and move about during simple daily activities, like laughing, dancing and eating. They can even sometimes fall out. People who wear dentures often have to give up the foods and activities they have always enjoyed, dramatically lessening their quality of life. Dentures often break or get lost, too. Clearly, dentures cannot solve the functional issues that dental implants address. Missing teeth can have a detrimental effect on your health, appearance and confidence. This is why oral health is extremely important to us. The Brighton Implant Clinic can help you get your perfect smile back, which we, in turn, find incredibly gratifying, because we are witness to how dental implants dramatically improve the lives and health of our patients. Book your FREE assessment now and see the benefit of replacing missing teeth 0800 111 6623.